Fundraiser by Donald Kinsey Jr : He's "Attending" Harvard! 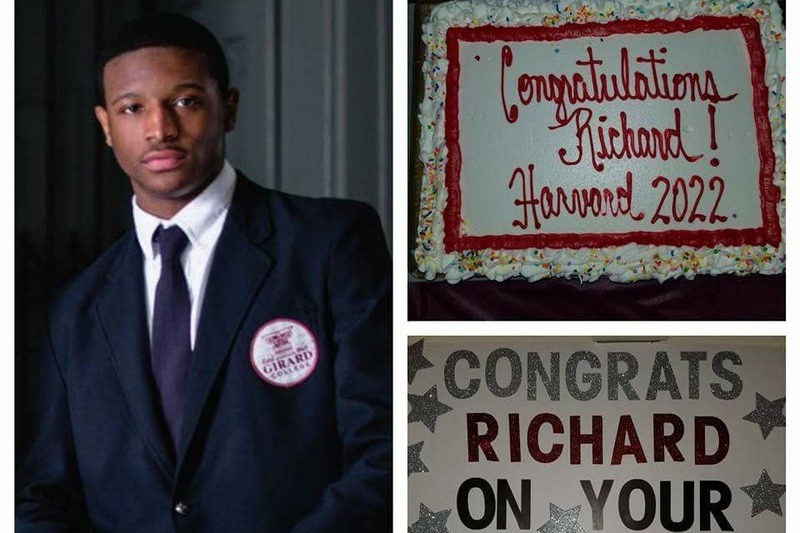 Richard Jenkins III, who turned 18 in April 2018, is from inter-city Philadelphia where he began his academic career in the Philadelphia public school system. His academic prowess and extraordinarily charming mannerism did not go unnoticed by his peers and educators. He received a full scholarship to Philadelphia's prestigious college preparatory boarding school, Girard College, and took full advantage of the opportunity presented to him. Richard will be graduating in June as valedictorian and will be attending Harvard University in the Fall. Richard comes from a poor struggling family, but highly disciplined. His father, Richard Sr, has a debilitating illness that prevents him from working, but that didn't stop him from raising his son with the type of values and morals that manifested into this wonderful young man. Richard Sr grew up in a Southwest Philadelphia projects and lost his mother when he was 20 years old. His father was never involved in his life. Most young men in that situation turn to drugs, crime, and gangs to fill the void and escape the existential pain of their existence. Not Richard Sr, he is the only man I know who never once took drugs, smoked, or had a drink. It's that sort of discipline I see in his son, and because of his father's love, young Richard's esteem was never in jeopardy. I'm creating this campaign because Richard Jenkins III deserves a reward. Honestly, this kid, although he is poor, doesn't need the help. He will work his way through college, pay for his expenses himself and won't ask or need anyone's help. He has a full scholarship to college and a stipend for room and board. He plans on working to pay for his daily expenses and entertainment, and I think that's a valid life experience for a young man going to college so I don't want to take that from him by making him too rich (LOL). He doesn't have a car, good clothes, or a good tablet to store all his electronic books (he's a confirmed bookworm). That's what this campaign is for...fun-time! He earned it. I recently extended the donations because I seriously underestimated the cost for Richard to attend Harvard. I divided the donations over four years, which meant Richard would receive $2,500 per semester to aide his living expenses. Richard still works to help mitigate expenses, but he had to reduce his working hours to accommodate his class schedule. It's a balance that all first year students struggle with, but Richard is adjusting. I texted him last week to see how he is doing. With about three weeks to go, he has nearly exhausted his funds. Folks, he's not doing to badly with his funding, but I don't want him to stress about money. I need your help. Granted, we still have most of the donations left, but I think we need kick it up a bit to help through the remaining three years. If you donated before, thanks...I don't want your money, but ask a friend to help. I received another comment recommending that I don't close the campaign because food, clothing, transportation home, and other miscellaneous expenses are much more at Harvard. I agree the money we raise alone will not be enough to sustain him over four years, but I don't want to take away his hunger. Do you remember what happened to the Phillies first-baseman, Ryan Howard, after the Phillies gave him that massive $25 million a year deal? He couldn't bust a grape afterwards. He lost his motivation. Right now, Richard still has to work to meet all his expenses, but thanks to you kind folks, he won't have to work as hard. Working through college is a valid life experience and I don't want to take it away from him. We are 93% towards our goal. Hurry and get your donation in before we close campaign. Someone pointed out to me that I forgot to mention Richard's mother in my statement. That was just an oversight. Richard has a very fine mother who loves, supports, and sacrificed her own needs for him. I'm a close friend of his father. Richard's mother is very smart. According to Richard's father, that's where he gets his smarts... from his mother!